Midwifery education and practice across the four countries of the United Kingdom (UK) (England, Wales, Scotland and Northern Ireland) is diverse and complex when considering the healthcare system as a whole. The Nursing and Midwifery Council regulates midwifery as a profession across the UK. Regulation and, hence, standards are undergoing change in light of legislative change due to the report of system failures within sections of the health service. These changes are occurring alongside the UK’s adjustment in allegiance with the European Union through ‘Brexit’. For many, this means uncertainty for the immediate and long-term future nationally. This will have an effect upon the delivery of healthcare regulation for all areas of health, financial security workforce provision and the delivery of education to future midwifery students. Whilst some may perceive this to be an anxious time for the newly qualified midwife, others seek out the opportunities that a period of change and uncertainty bring. This is the time for newly qualified midwives to carve the future of the profession and for themselves in terms of career aspirations and development. Andrews A. The balls in your court. 2009. Available via https://www.rcm.org.uk/news-views-and-analysis/analysis/the-ball%E2%80%99s-in-your-court. Accessed 2 Sep 2017. Birth Choices UK. Historical statistics–normal birth. 2010. Available via http://www.birthchoiceuk.com/Professionals/Frame.htm. Accessed 6 Feb 2018. Care Quality Commission. How we do our job. 2017. Available via http://www.cqc.org.uk/what-we-do/how-we-do-our-job/how-we-do-our-job. Accessed 6 Feb 2018. Emmerson C, Frayne C, Goodman A. Pressures in UK health care. Challenges for the NHS. 2000. Available via http://www.ifs.org.uk/health/nhsspending.pdf. Accessed 2 Aug 2007. Gaia Insights. Generation Y characteristics. 2015. Available via http://www.generationy.com/about-generation-y-in-the-workforce/characteristics/. Accessed 6 Feb 2018. Health and Social Care Information Centre. NHS workforce statistics. 2014. Available via http://tinyurl.com/p9458n8. Accessed 6 Feb 2018. Health Education England (HEE). Health education England working across England. 2018. Available via https://www.hee.nhs.uk. Accessed 23 Feb 2018. Health Education England. Workforce planning and information Leeds, Health Education England. 2015. Available via https://www.hee.nhs.uk. Accessed 6 Feb 2018. Hunter B, Warren L. Investigating resilience in midwifery. Final Report. Cardiff: Cardiff University; 2013. Available via http://tinyurl.com/hd79kpc. Accessed 15 Oct 2017. ICM. The definition of a midwife. 2017. Available via http://internationalmidwives.org/who-we-are/policy-and-practice/icm-international-definition-of-the-midwife. Accessed 2 Feb 2018. Murphy H. Preceptorships for newly qualified staff Leeds, NHS Employers. 2014. Available via http://www.nhsemployers.org/your-workforce/plan/education-and-training/preceptorships-for-newly-qualified-staff. Accessed 14 May 2017. NHS Education for Scotland. Flying start in Scotland. 2017. Available via http://flyingstart.scot.nhs.uk. Accessed 14 May 2017. NHS England. Better births- improving outcomes of maternity services in England: a five year forward plan. 2016. Available via https://www.england.nhs.uk/wp-content/uploads/2016/02/national-maternity-review-report.pdf. Accessed 28 Nov 2017. NHS England. A-Equip midwifery supervision model. 2017. 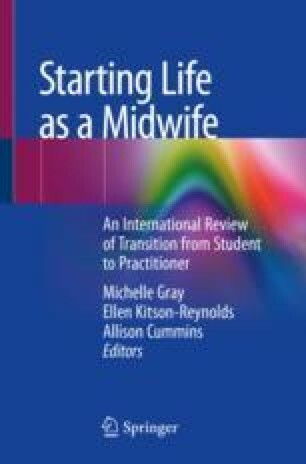 Available via https://www.england.nhs.uk/mat-transformation/implementing-better-births/midwifery-task-force/a-equip-midwifery-supervision-model/. Accessed 6 Feb 2018. NHS Leadership Academy. The Edward Jenner programme: the foundations of leadership. n.d.. Available via http://www.leadershipacademy.nhs.uk/programmes/the-edward-jenner-programme/. Accessed 14 May 2017. NISRA. Registrar general annual report 2016 births. Crown Copyright. 2017. Available via https://www.nisra.gov.uk/statistics/births-deaths-and-marriages/births. Accessed 6 Feb 2018. NMC. The Code. 2015. Available via http://www.nmc.org.uk/globalassets/sitedocuments/nmc-publications/revised-new-nmc-code.pdf. Accessed 20 Oct 2017. NMC. What is a nursing associate? 2017b. Available via https://www.nmc.org.uk/standards/nursing-associates/what-is-a-nursing-associate/. Accessed 6 Feb 2018. NMC. Revalidation your step by step guide through the process. London: NMC; 2017c. Available via http://revalidation.nmc.org.uk. Accessed 6 Feb 2018. NMC. Becoming a midwife. 2017d. Available via https://www.nmc.org.uk/education/becoming-a-nurse-or-midwife/becoming-a-midwife/. Accessed 15 August 2017. Nuffield Trust. The NHS is the world’s fifth largest employer. 2017. Available via https://www.nuffieldtrust.org.uk/chart/the-nhs-is-the-world-s-fifth-largest-employer. Accessed 6 Feb 2018. O’Neill O. The King’s fund–safe births: everybody’s business. An independent enquiry into the safety of maternity services in England. 2008. Available via https://www.kingsfund.org.uk/publications/safe-births-everybodys-business. Accessed 6 Feb 2018. ONS. Births in England and Wales: 2016. 2017. Available via https://www.ons.gov.uk/peoplepopulationandcommunity/birthsdeathsandmarriages/livebirths/bulletins/birthsummarytablesenglandandwales/2016. Accessed 2 Feb 2018. Rivett G. Bevan and the NHS 1945–1948. 2015. http://www.nhshistory.net/bevan.htm. Accessed 6 Feb 2018. Royal College of Midwives. RCM welcomes degree-only nursing profession. 2009a. Available via http://www.rcm.org.uk/midwives/news/rcm-welcomes-all-degree-nursing-profession/?locale=en. Accessed 2 Feb 2018. Royal College of Midwives. Senior midwives report falling budgets despite rocketing birth rates. 2009b. Available via http://www.rcm.org.uk/college/media-centre/press-releases/senior-midwives-report-falling-budgets. Accessed 2 Feb 2018. Royal College of Midwives. Campaign for healthy workplaces delivering high quality care. 2015. Available via https://www.google.co.uk/url?sa=t&rct=j&q=&esrc=s&source=web&cd=2&cad=rja&uact=8&ved=0ahUKEwjivojmwoHXAhUiLMAKHap9D3QQFggtMAE&url=https%3A%2F%2Fwww.rcm.org.uk%2Fcaring-for-you-campaign&usg=AOvVaw0l15g2diqgNazWfg96qXqi. Accessed 21 Oct 2017. Royal College of Midwives. Birth rate rise–“3500 midwives needed”. 2016a. Available via https://www.rcm.org.uk/news-views-and-analysis/news/birth-rate-rise-%e2%80%93-%e2%80%983500-midwives-needed%e2%80%99. Accessed 1 Sep 2017. Royal College of Midwives. Work related stress. 2016b. Available via www.rcm.org.uk/equality-and-diversity. Accessed 20 Oct 2017. Royal College of Midwives. Caring for you campaign–working in partnership. 2016c. Available via www.rcm.org.uk/caringforyou. Accessed 19 Oct 2017. RCM. Better births campaign. 2018. Available via https://betterbirths.rcm.org.uk. Accessed 23 Feb 2018. Royal College of Midwives. Royal College of midwives statement on the outcome of the referendum on membership of the EU. 2017. Available via https://www.rcm.org.uk/news-views-and-analysis/news/royal-college-of-midwives-statement-on-the-outcome-of-the-referendum-on. Accessed 15 Oct 2017. Scottish Government. Births, deaths & other vital events, 2017 Q3 published Dec 2017. 2017. Available via https://beta.gov.scot/news/births-deaths-other-vital-events-2017-q3/. Accessed 12 Jan 2018. Skills for Health. Apprentices service. 2017. Available via http://www.skillsforhealth.org.uk/about/national-skills-academy-for-health/item/167-apprenticeship-service. Accessed 5 Feb 2018. The Kings Fund. Ideas that change healthcare. 2018. Available via https://www.kingsfund.org.uk. Accessed 6 Feb 2018. Trueman CN. “A history of the European Union and great Britain” The history learning site. 2015. Available via https://historylearningsite.co.uk. Accessed 23 Feb 2018. Willis L. Raising the bar. Shape of caring: a review of the future education and training of registered nurses and care assistants. 2015. Available via https://www.hee.nhs.uk/our-work/developing-our-workforce/nursing/shape-caring-review. Accessed 7 Feb 2018.